Trailer and motorhome tires are the unsung heroes of the RV world. They get put to the test daily by carrying heavy loads and enduring all kinds of extreme road conditions. Even when not in use, they can wear down without owners giving their tires a second thought. 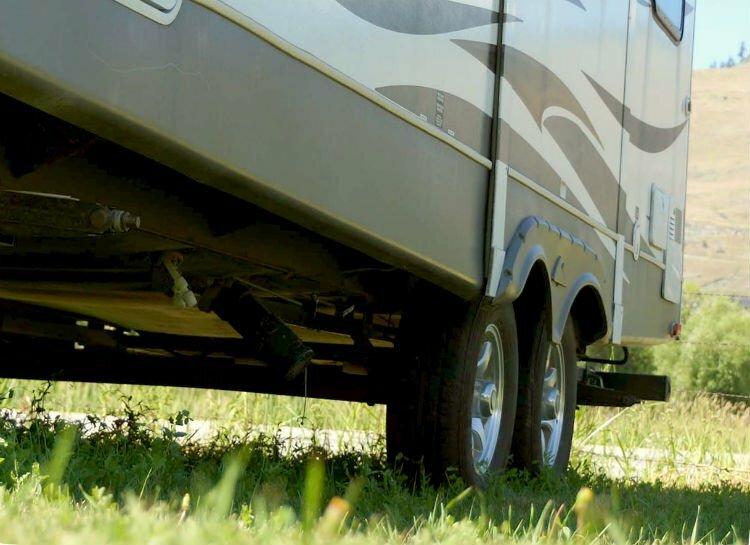 RVers can significantly increase the life and performance of their trailer and motorhome tires by following a few simple procedures during the season. The wear and tear on RV tires can potentially catch up with RVers, usually when it’s least expected. According to Kal Tire of Vernon, British Columbia, giving your tires some added TLC and following these five tips, RVers can increase the life and performance of their tires to achieve a smooth, trouble-free season on the road. You should check your RV tires every morning during travel, as well as before and after trips. After driving across rocky or rough terrain, inspect the sidewalls, treads, even the valves and caps for nails or other damaging debris. Also look for cuts, bulges, and signs of cracking and weathering. Some of the top-of-the-line RV tires feature scuff guards that resist sidewall damage from curbing, and according to Kal Tire, the sidewall shoulders in particular aren’t always a match for the debris they meet on the highways and byways. To achieve the utmost performance, ensure the tires are inflated to the recommended PSI. Under-inflated tires can cause poor handling, increased or irregular wear, decreased fuel economy, and even structural damage. Over-inflated tires can cause uneven wear, and compromise traction, braking, handling and create a bumpy, noisy ride. To maintain the integrity and performance of your tires, Kal Tire suggests you check your RV tires every morning during travel, as well as before and after short distance trips, before and after storing your unit, and once a month in the off-season. For the most accurate reading, check your air when the tires are cold (and haven’t been driven for a few hours as temperature fluctuations lead to pressure fluctuations). Always use a truck tire gauge that features a dual-angled head for dual wheels. When traveling in high altitudes or extreme temperatures, inflation should be checked more regularly as both conditions can have a big impact on air pressure. When your RV or trailer tires are supporting an even load and an acceptable weight, you’ll experience better handling, braking, fuel economy, tread life, and tread wear. For best results, pack up your RV or trailer with everything you’re taking and anything you might be towing. Then, visit a weigh station to get an accurate weight reading and ensure you’re not exceeding the gross vehicle weight rating (GVWR). Tire experts can advise you about rotating your RV or trailer tires. If your tires are out of balance, you’ll see cupping and uneven wear. Have your wheels balanced especially when you’re mounting new tires, when your tires are being rotated, when you’ve had a flat repaired, or any time a tire has been removed. Tire experts can advise you about rotating your RV tires and the owner’s manual will recommend the rotation pattern that’s best for your unit. Taking care of your tires in the off-season is just as important as how they are taken care of during the travel season. While many RV tires now come with advanced weather- and crack-resistant rubber compounds, you can still extend the life an RV tire significantly with proper storage. To maintain the integrity and performance of your tire, Canada-based Kal Tire suggests you check your RV tires every morning during travel. Before storing your tires, clean them with a soap and water solution to eliminate any oils that have clung to the tread on the highway. Unload all your supplies so the tires are supporting only the minimum weight. Inflate your tires to the recommended PSI. Always use storage blocks to take the weight off your tires. Store your vehicle in a cool, dry space where the tires won’t be subject to direct sunlight. At least every 12 weeks—if the weather is mild—take your RV for a short drive to allow the make-up of the rubber compound to work, prevent cracking, and avoid getting flat spots. Due to the heavy loads and duty cycles of trailer tires, its recommended that trailer tires be replaced within three to five years, regardless of tread depth or usage. RVers must ensure they have the right kind of tires for their unit. Passenger tires are not meant for many trailers. 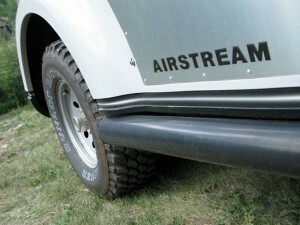 RVs can be equipped with light truck tires, but most trailers require special trailer (ST) tires. They are built with stiffer, heavy-duty sidewalls that can accommodate heavy loads and track straight to reduce bounce and sway issues. Why would I need to remove weight from the unit [5, •2] if I’m going to put the axles on blocks [5,•4]? These are a few recommended ways of maintaining your tires during storage. Essentially, tires should be removed during long-term storage and the axles be placed on blocks (to ensure all the weight is off the tires). If this is not possible, then remove all supplies from the unit so the RV is supporting only the minimum weight. Hope this clarifies your question and thanks for your interest! When keeping a motor home on Grass/gravel should you put boards under the tires to keep them off the ground? Thanks for your question. Yes, you want to put boards under your tires on grass/gravel (and other areas for that matter) or during cold/wet seasons. The whole tread should be on the boards for proper storage. 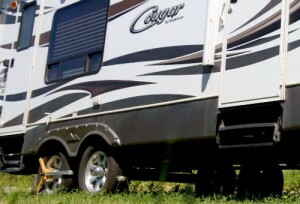 You may want to also use UV-resistant tire covers that can be purchased at many RV retail stores. In the Past I have put 3/4 plywood down and covered the tires. Only problem is when I leave the site for a trip people steal the plywood so I need to start over agaim. Taking the plywood with you is the only (obvious) answer, Bob! I bought the Basement 24′ x 24′ blocks from Home Depot. They are made to put on basement concrete floor and keep moisture from hitting carpet.About 2 ” thick.It has a corrugated plastic bottom and OSB plywood top.I Installed Ice and Water Shield . No Gravel. Just rubber.over plywood.I park all my trailers on theses blocks.Work well. Can you clarify, what is Ice and Water shield? Goes under first course of Roof Shingles. You need to look for the Smooth – Non Granular types. Heavy Weight. You can just put this under tire. It is a rubber based product. What about storage on concrete? We have a Class C 28 ft and just leave it on the concrete driveway with wheel covers and inflated to max cold for the tires. We buy Firestone since if they go bad on a trip you can find them almost anywhere across America. We also have a TPMS which is the only way to go. Never had a problem and have driven on these tires over 8k miles. I recommend putting your unit on jack stands but not in the usual way. lift the unit up just enough to take the weight off the entire suspension. This makes for a more stable platform saves the tires and relaxes the suspension. Make sure that you have a level surface that is capable of handling the weight. Does armor all or other tire dressing help prevent cracks? Armor All does have a tire foam protectant solution that offers a few benefits for your tires, including the use of blocking agents that are designed to protect your tires from the elements that can cause cracking. You may want to contact the customer service at Armor All for further benefits or cracking remedies. DO NOT use Armor All Products on ESPECIALLY TIRES ! If you use inside your vehicle.Do not stop.It is like Heroin.If you stop your dash and seats will crack.It has a Petroleum distillate in it. Never use any Petroleum based product on your tires .Ever !! Use 303 AeroSpace Protectant.I also stop at the truck stops or repair shops that work on trucks.They sell a Thick 1 Gallon product you dilute.It is a light Purple, Wysteria color.Forget the name though it is safe on Truck and RV tires. Never use Armor All.. Your tires will crack and soften. Thanks for the added suggestions. Armor All may have come out with a newer product. I would not use it.I do not care what they say. A gallon of 303 goes a long way and you can do the roof sidewalls , tires , canopy Interior and Exterior of RV anything .It is good stuff,Most dealers.That is their trick.No wax.Wash and 303 and wipe off.Saves Gel Coat with UV protectants..Though AMAZING is the best for Awnings made by Bio Clean.All Bio Cleans Products are Amazing .Though Amazing is Amazing.I ran out of 303 on awning and sprayed 2nd 1/2 of awning with Amazing.OMG,,,, The difference was like Satin Paint up to High Gloss. We have Michelin tires, the manufacture told me to only clean with soap and water. That’s it, never never put anything on the tires. They also have a 5 year warranty, but Michelin extended that to 7 years with not cost to me. Check your tire manufacturer for their recommendation. “Never exceed the GVWR’ assumes that you’re safe when loaded to the GVWR. Factory tires in many cases are unsafe when loaded to the GVWR. The reason is that as soon as the vehicle moves, additional loads are imposed on the tires. Factory tires are sized based on DOT standards that don’t take this into consideration, so they’re likely to be near full load when the vehicle is sitting still. When the vehicle travels on a curve and leans on the outside tires, the tires will be overloaded by 30% or more (using my trailer when towed on a posted 20mph curve as an example), The same thing happens when the vehicle leans on the leeward tires in a crosswind. Until the DOT standards are updated, and the industry catches up, the fix is to install better tires, and perhaps wheels, with higher load ratings. Its also recommended “the combined capacity of the tires should exceed the loaded trailer weight by 20 percent”. Because this doesn’t include a subtraction for hitch weight it represents a roughly 30% increase in tire load rating compared with industry practice. Following this recommendation goes a long way towards preventing tire overloads and therefore failure when underway. I’m sorry that some people have to talk down to you on a media page. Glad you didn’t answer back. I went to Home Depot and Bought those 2 ‘ x 2′ blocks for basement floors.They are OSB with Corrugated Plastic on them.Then I Installed Rubber.The old Thick Ice and water shield to tops .Wrapped around and stapled to bottom on corrugated plastic.These sit under all my trailers tires.The problem.After 5 years the OSB broke down. another Item I found is Old Trucker Mud Flaps. Call a truck Repair shop or a Trucking out fit and ask if they have old Mud / Splash flaps around.They are great to park your RV or Trailers on. Grass will kill your RV and Tires..Good Luck.You can also Make the 2′ x 2’ rubber bases out of cut Marine ply and Install rubber roofing to it. Lots of options. Again .use 303 aerospace , or products without petroleum in it for your tires. The same way you’d do on any other car. Check your owners manual for the recommended front and rear pressures. Generally, your pressure shouldn’t fluctuate that much within a month, and if you experience any significant drops, then it’s a good idea to check and make sure your tire isn’t leaking. There are changes coming, but the question remains will these be great advancements or more of a benefit or pain? As it turns out there is no easy way to answer that. Autonomous trucks will truly upend the industry as we know it today, but at least we have time before it becomes a major concern. Tires are an important safety factor no matter what type of rig you run. My popup originally came with Chinese tires that were cheap and junk! After one blow out, I changed over to Cooper 8 bias ply tires. Increased load capacity and safety margin. For trailers, bias ply are better than steel belted tires. Be aware that trailer tires are speed limited. Mine were rated for 65 MPH so I never exceeded 60 MPH when towing. I am amazed at trailers including boat trailers cruising down the Interstate at 80+ MPH! Ever wonder why you see so many blowouts? Exceeding the rated speed limit will do that every time! I had one of my Good Year Original tires blow on my rear Class A Motorhome. It blew through 1/8” plate steel and Destroyed my Generator. The bottom Isolator plate was gone. The secondary was cracked in half. The. Fuel pump breakers gone. Two months later . I read in RV life that Good Year had a recall. The tires were peeling. That is what the tire looked like. It peeled like an orange. The tire was taken away by the Repair company. I had to install all new Michelin XRV’s all the way around so they matched. Also , I did not, nor did my family feel safe on these tires. How , hos can I prove these tires were on my Motor Home. The Recall tires ??? . It cost me iver $9800.00 just to repair the blow out damage. Not conting the damage the flying debris caused to our pull behind Trailer. Then the cost of Six (6) New Michelins. These tires had 9000 miles on them and only 4 years old. Any Help would be Great. Thank you. I have a Winnebago class A, the tires are Michelins, with approx 6000 miles on them. I keep them covered when in storage ( on gravel). The tires were made early 2012. I have noticed spider cracks on the sidewalls this year when uncovering. The cracks are very small , barely noticeable and the areas are approx 6″ in diameter, 1 or 2 per tire. I checked with a local tire dealer and he did not hesitate to tell me that they should be replaced after 5 years, (he never saw them). The Michelin website has a chart that shows tires that are acceptable to unacceptable. My tires are better than the best ones on the chart. Who can I get to give me an honest opinion instead of a sales job?